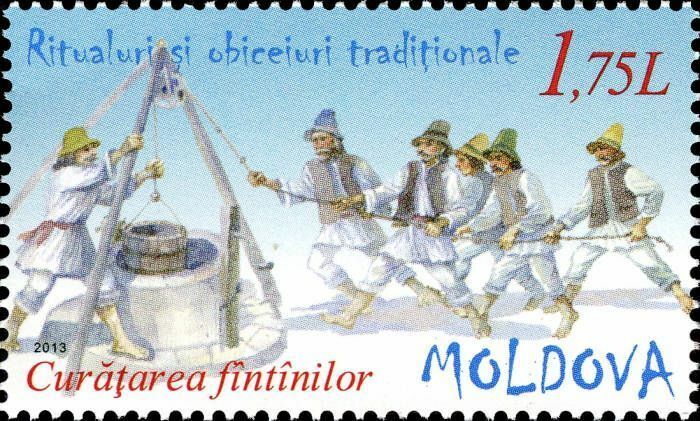 On 20 June 2013, the Post Office of Moldova (Poșta Moldovei) issued a series of postage stamps with the title Traditional Rituals and Customs (I). The issue comprises two stamps, with associated cancellation (postmark) and first day cover (FDC). The designer was Simion Zamşa. The printing was performed by Nova Imprim, Chişinău. Paparuda is a Romanian and Bulgarian rain ritual, probably of pagan origin, performed in the spring and in times of severe drought. 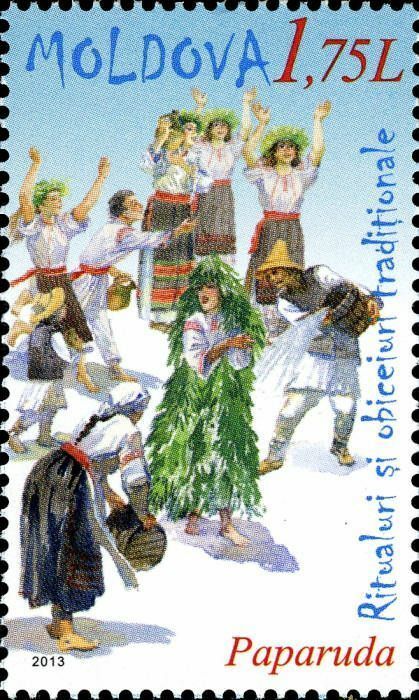 A girl, wearing a skirt made of fresh green knitted vines and small branches, sings and dances through the streets of the village, stopping at every house, where the hosts pour water on her. She is accompanied by the people of the village who dance and shout on the music. The custom has attributed a specific type of dance and a specific melody. Read more.. This article uses material from the Wikipedia article 'Paparuda', which is released under the Creative Commons Attribution-Share-Alike License 3.0.